Reading is one of the most inspiring habit for the children. It acts not only as a hobby or entertainment, but also as an educational activity that opens doors to a vast pool of knowledge. The Oak Library is an educational and cultural environment where individuals are exposed to ideas through the use of print and non-print resources in many media formats. The library provides curricular support by the provision of materials, collaborative curricular support through consultation with teachers, informal instruction and individual mentoring, communication with faculty, online and library oriented research support during school hours, as well as the fostering of life long love of reading.. The Oak library collection continues to expand in all formats. 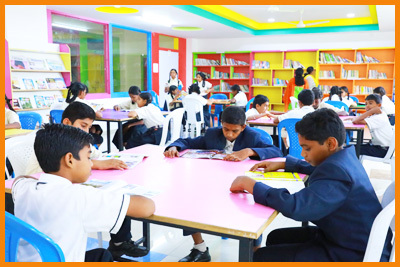 We have created the ambience and atmosphere to reignite passion for reading amongst students through our library. 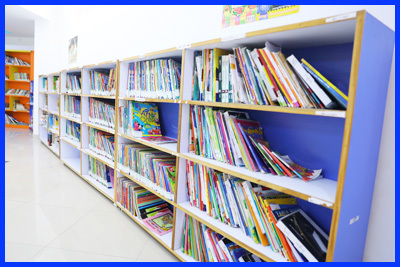 Our library is a place where new books are added day by day for both students and teachers. Teachers have separate research space with computer and internet facilities where they can carry out academic subject research or other related work. We now offer student and faculty more than 6000 resources including books, DVDs, CD – ROM etc. We also subscribe to a number of magazines, periodicals, newspapers and research reports. It is of magazines, periodicals, news papers and research reports. It is well equipped to cater the needs of different age groups.